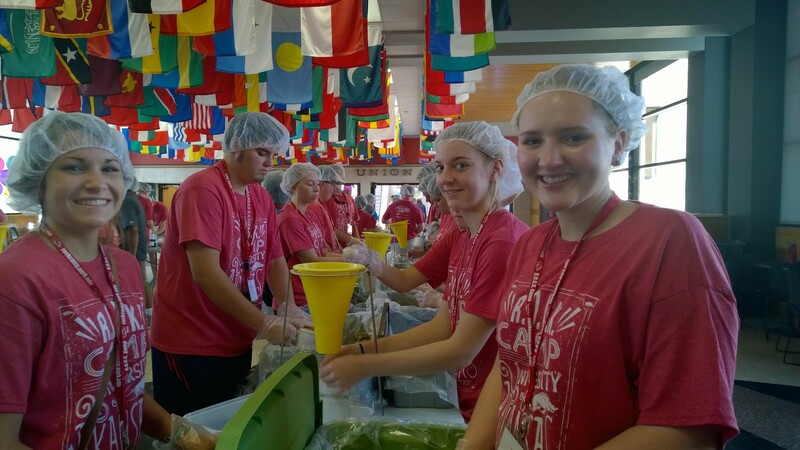 Students participate in a volunteer effort at the Arkansas Union to package food supplies. The Center for Community Engagement and the Volunteer Action Center are excited to announce the new Volunteer Management system available to students, staff, faculty, and community members. GivePulse is a comprehensive volunteer platform that will allow users to locate volunteer opportunities on campus and around the Northwest Arkansas community. Signing up is easier than ever before and can be done from the comfort of your browser or using the iPhone app. Additionally, users can log their service hours and have them verified by volunteer supervisors. Logging service hours through GivePulse will automatically keep track and enter you into any qualifying awards, such as the President's Volunteer Service Award and the Chancellor's Community Service Award. GivePulse offers helpful administrative tools to effectively implement service into your department, office, class, registered student organization, or Greek Life chapter. Alternatively, it is very simple to list opportunities and events for students to volunteer. If you need assistance creating an account for your group or listing a service project, please let us know. If you are interested in engaging with your campus and community, sign up for GivePulse and find a project to volunteer with today! To access GivePulse, visit uark.givepulse.com or follow the link located at service.uark.edu. Using your University of Arkansas login credentials, you can click "Log In" at the top right hand corner of the screen. GivePulse has replaced volunteer.uark.edu. Giving back to the community is easy, fun, and a great way to meet other people at the university. If you need any assistance, please email vac@uark.edu or call 913-575-4365.